Enclosure Volume Up to 650 Cu. Ft. Comments: This is my third unit. Two smaller units provided cumulative 24 years of service. The current unit is larger with 650 cu ft of cooling. It has been installed less than a month so durability and potential service life is unknown and the rating is meaningless. This is a model with reported problematic operating history. My experience with Previous units required minimum repairs and parts. The condenser on the Last unit, a 2200 model, expired almost within 10 years to the date it was installed. After 9 years of operation this unit only required replacement of the SentryIII control system (thermostat), A $175 part;very easily installed. 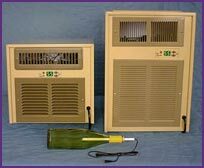 Comments: We bought a Breezaire WKL series Wine Cooling Unit from the Beverage Factory a little over six years ago and were well pleased with it. Unfortunately, it started leaking Freon recently and it made no sense to try to repair a six year old machine. We ordered a new one from the Beverage Factory and, as before, their Customer Service and Sales Departments gave us excellent service. We wouldn't shop anyplace else.